Housetraining is one of the first things you will teach your new puppy. This should be started as soon as you take your dog home, but it takes patience. In general, puppies are unable to control their bladders and bowels until 12 weeks of age. If your puppy is younger than that, extra patience is required. A few key things to remember when housetraining a puppy. Praise the dog when it behaves. Never punish the dog physically for an accident. Do not correct the dog unless you catch it in the act. Consistency is the best way to teach your puppy housetraining. Try to get up at the same time each morning, and take your puppy outside right away. Feed your puppy at the same times each day and take it outside immediately after eating. As your dog gets older you may even be able to anticipate when it will need to go based on when it was last fed, provided you stick to the feeding schedule. If you see your puppy sniffing, circling, and pacing, it is probably time to go, so take it outside immediately. If you catch it in the middle of an accident, say “no” firmly and take the dog outside to finish, praising when it does. Never punish a dog by hitting or pushing its nose in the mess. This will only teach the animal to fear you. If you find an accident in the house, but do not catch the puppy in the act, do not bother punishing it. The dog will not associate the punishment with the action and will only become confused. Using a phrase like "outside" or "do your business" consistently will help your dog learn it as a command. Always bring your puppy to the same area outside while housetraining. The odors in this area will encourage it to urinate and defecate here again. When the dog does its business, be sure to offer praise. When you are away from home, your puppy should stay in a crate or kennel. You may buy a larger crate for your puppy to grow into, but place a divider in it so that it is only large enough for your puppy to turn around and lie down. Instinctively, your puppy will not want to soil its own area. Be careful not to let your puppy stay in the cage for more than four to six hours, or it may have no choice but to relieve itself. If you are away from the house regularly, as many of us are for work, return home in the middle of each day to let your puppy outside. Arrange for someone else to let your puppy out if you will be unable to come home. If you choose not to crate your dog when you are away from the house, set up a room with a non-absorbent floor. Place training pads at one end of the room and the dog's bed and toys at the other. Generally, dogs prefer to urinate on absorbent materials, but they tend to avoid doing so in their own beds. Ideally, the puppy will gravitate toward the training pads. This may take longer than using a crate. Housetraining may take several months, so don’t give up. Remember that your puppy wants to please you, it just needs to learn how. Be clear with the puppy when you praise or correct its actions. Eventually, you will see results. 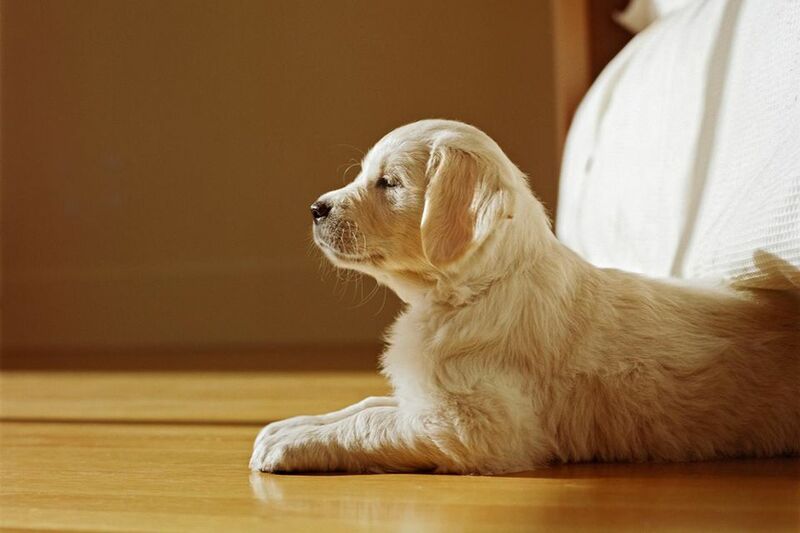 If your puppy does have an "accident" in the house, be sure to use a cleaner that will eliminate the odor entirely. If your dog picks up the scent, it may think the area is OK to use again. If your dog is going through a stressful time or is ill, it may backtrack on its housetraining and have an occasional accident. This is frustrating, but if you can identify the source of the problem, you should be able to stop the behavior. Dogs whose routines have been disrupted, such as with a new baby in the house, or a move to a new place, often regress slightly. Accidents in a previously housetrained dog often signal an underlying health problem, such as a urinary tract infection. Take your dog to the vet if this begins happening without an apparent reason. How Should You Introduce a Puppy to a Crate?